Equality in spending: Costs are the defining issue in the health care debate, and Brookings Institution economist Gary Burtless offers some revealing new data showing the remarkably equal distribution of health spending among Americans in all income categories. Yes, the uninsured need coverage, and we must make changes so more affordable coverage will be more widely available and portable. But as politicians, interest groups, and the media continue to repeat that our health system is “hopelessly broken,” “in crisis,” and “must be completely replaced,” it’s important to understand what’s happening now so we fix the right problem. He notes that spending is driven by federal and state programs for the poor, the disabled, the elderly, children, and other groups; by expensive job-based health insurance that depresses take-home pay; and income transfers from the young to the old through taxes and cross-subsidies of private insurance. Samuelson notes that we’ve gone from spending $1 out of every $20 in our economy on health care in 1960 to $1 out of every $6 today. He questions whether we should institute policy changes that make health care a “right,” requiring even more government spending that would crowd out other national needs, such as schools, roads, defense, and scientific research. Free-riders: Tom Miller of AEI illuminated another aspect of the health spending debate in a recent Health Affairs post, commenting on a new study which he says “continues to rain on the political parade” of the free-rider argument — i.e., the insured pay much higher premiums to compensate for the costs of the uninsured and therefore we must mandate coverage for all. “The key numbers reported by Hadley et al are that the uninsured received $56 billion in uncompensated care for 2008 (2.2 percent of all health spending), of which approximately 75 percent ($43 billion) was paid for through public funds directed to the costs of the uninsured,” Miller writes. This means that the real cost-shift from uncompensated care would be $13 billion, out of a health care economy of $2.2 trillion — about half of one percent. For those, including former Massachusetts Gov. Mitt Romney, who use the free-rider argument as a rationale for an individual mandate and all of the associated regulation and complexity it entails, they might want to look again at the facts. “No matter how one tries to slice and dice this, there’s just not much of a residual of implicitly subsidized health costs to be potentially picked up by shifting those costs to private payers of higher premiums,” Miller writes. Bottom line: We need changes in our health sector, but let’s get a clear picture of the system today before we make sweeping policy changes. 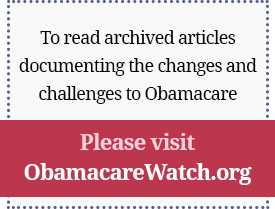 New Web site features: We’ve updated our Web site with several a new features including a new section, 2008: Your Health, Your Vote, focused on the presidential candidates’ health care plans. You’ll see the new red banner with the stars on the home page. It includes blog posts about health care in the news as well as a resource page for those seeking information about health issues in the campaign. In case you missed it, you can listen online to Grace-Marie in a public radio segment about women and health care with Cecile Richards of Planned Parenthood. On the home page, you can also watch video of Grace-Marie on the Fox Business Network talking about her recent Wall Street Journal article. Follow us as we follow the issues right up to the election! More video and audio are available on the Galen Multimedia page. For example, you can view Grace-Marie’s recent presentation to the Oklahoma Health Care Reform Task Force. Interact with us! We welcome your comments on any of the pieces posted on our site. Whether you’re reading Health Policy Matters or our latest commentary, you can quickly give feedback and interact with other Galen readers just by posting a comment. No registration is required. Elvis: I was a reporter for the Albuquerque Journal in April of 1972 when the switchboard operator forwarded a call to me. It was from a woman asking for our help in arranging for her daughter, Denise Sanchez, to meet Elvis when he was in town for an upcoming concert. I found a copy this week of the article I wrote about that meeting in 1972, which I still remember vividly. Eight-year-old Denise had cancer, and her doctors had run out of treatment options for her. Meeting Elvis was her fondest wish. I got on the phone and somehow tracked down “The Colonel” — Col. Tom Parker, Elvis’ famous manager — to see if he could arrange it. Amazingly, he said yes. He asked us to come backstage where we would be escorted to The King’s dressing room, which was actually a small Airstream trailer. The Colonel greeted us and took Denise, her mother, my photographer, and me inside to meet Elvis. He was dressed in a white satin suit studded with rhinestones, with a blue cape over his shoulders. “Hello, sweetheart. What’s your name?” he asked Denise. He could not have been more kind. 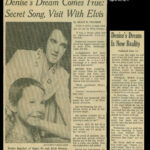 Elvis took Denise on his knee and talked quietly with her. She asked him to sign a poster, then asked him if he would sing a song for her. He said he would, but he wanted it to be a surprise. Before a sell-out crowd of 11,847 fans, he sang for Denise “You Gave Me a Mountain This Time.” There was barely a dry eye in the house. Denise died several months later. But at least one dream had come true for her. To meet Elvis. Reporter Chris Cuomo did two “Good Morning America” stories inviting viewers to “Meet the Joneses” — representing an average American family — and see how each candidate’s plans for health reform would help or hinder them. Republican Sen. John McCain (Ariz.) advocates more patient choice and flexibility in the health insurance system, but ABC News medical editor Dr. Tim Johnson scoffed at that notion in a September 5 story, writes Menefee. “The idea that individuals are going to have enough knowledge and enough savvy and enough insight and, frankly, enough guts to make choices all by themselves is pretty much a pipe dream,” Johnson said. When it comes to the presidential candidates’ health care plans, journalists could do a service by explaining the differences to voters. ABC’s “Good Morning America” gave the impression of doing that, but instead gave a confusing presentation that was insulting to viewers. The Associated Press examines Senator Barack Obama’s health plan and its provision that would require health insurance companies to sell health insurance to all applicants regardless of illness or condition, often called “guaranteed issue.” This is not a new concept, but it has had a troubled history in several states that tried it, writes the AP. Some states, such as Kentucky and South Dakota, eventually dropped the guaranteed issue requirement after insurance companies pulled out of their markets. In the few states where guaranteed issue continues, monthly premiums generally are much higher for younger, healthier people than in nearby states. The effects of 60 years of tax policy are thoroughly woven into labor markets and health insurance design, writes Helms in a letter to the editor. If this open-ended tax policy has caused us to develop an inefficient form of health care delivery, then it seems logical that some sort of limit could start us on the path to a more cost-effective system. Reforms of the individual insurance market would help, but the greatest potential for improvement is in the employment sector, where three-fifths of our population now receives coverage. Velamuri, a lecturer in the School of Economics and Finance at Victoria University of Wellington, examines whether the availability of health coverage through a spouse’s health plan influences a married woman’s decision to become self-employed. The Tax Reform Act of 1986 (TRA86), which introduced a tax subsidy for the self-employed to purchase their own health insurance, provides an opportunity to isolate the effect of the price of health insurance on employment-sector choices. The findings in this paper suggest that in the pre-TRA86 period, the high cost of health insurance created a significant wedge in the price of health insurance between the wage-salary sector and self-employment. Women who had a preference for working in the self-employment sector and who enjoyed spousal health benefits were able to exercise their preference and select into self-employment. On the other hand, for some women with a preference for the self-employment sector but restricted in purchasing their own health insurance, it was too costly to opt for this sector. For these women, the TRA86, by narrowing this price wedge, lowered the price of selecting into their desired sector of employment. tate mandates that inhibit the creation of a national market, not regional variations in health care costs. Allowing residents to purchase coverage across state lines would create more competitive insurance markets, write Herrick and House. In addition, letting insurers experiment with different designs to create innovative and cost-effective health plans will decrease the number of people who cannot afford care. The most beneficial and yet most disruptive innovations will likely be those that change the medical institutional structure experienced by citizens facing increases in medical spending that cut deeply enough into their incomes, writes Pauly. Changes like MinuteClinics and specialized hospitals will not be enough. A necessary condition for improvement is a change in the tax treatment of health insurance so that consumers who are willing to be daring do not have to share their financial gains with the U.S. Treasury, but this change alone will not be sufficient. A mindset and a legal system that allow consumers to opt out of the best possible improvements in care (regardless of cost) for a less aggressive alternative is the main other condition, but how to put this condition in place will require more than investigation of other firms in other markets. The discussion should be led by experts and policymakers who are willing to admit and deal with trade-offs between cost and quality. Patients aged 18 to 44 accounted for 43% of the people visiting retail clinics, compared to 23% for primary care physician offices. Just 39% of the patients at retail clinics said they had a primary care physician, while 80% of people surveyed nationally say they have a personal doctor. Patients visiting retail clinics when they first opened were likely to pay the cost out of their own pocket, but most patients are now using insurance to pay the bills. The percentage of retail office visits paid for out-of-pocket dropped from 100% in 2000 to 16% in 2007. About 90% of the visits to retail clinics were for 10 simple acute conditions and preventive care such as upper respiratory infections, sore throat, and either a screening test or a blood test. The same conditions accounted for 18% of visits to primary care physician offices and 12% of emergency department visits. Daniel Costello, a reporter for the Los Angeles Times, writes about retail clinics “bulls” and “bears” and their differing visions of where this new site of health care is heading. Costello also describes the history of retail clinics, drivers of growth, quality of care issues, and regulatory concerns. Subsidizing individuals with high expected health costs is an effective way to increase the private insurance coverage of other high-cost individuals, write Cogan et al. The authors assess an historic example of a policy intervention of this sort, i.e., the extension of Medicare benefits to the beneficiaries of the Social Security Disability Insurance (SSDI) program, on the private insurance coverage of non-disabled individuals. The authors find that the insurance coverage of individuals who had a health condition that limited their ability to work increased significantly in states with high versus low rates of disability. The expansion of Medicare not only increased coverage among the targeted population of the disabled, but also among people who were similarly situated but less seriously impaired, suggesting the potential usefulness of subsidies to high-cost individuals in promoting insurance coverage generally. The authors also find that the comprehensiveness of private health insurance increased significantly after the extension of Medicare in states with high versus low rates of SSDI beneficiaries. Last year’s SCHIP debate appeared to be less about providing affordable health care to low-income children than about bailing out states that had overextended their budgets. Among the states that received nearly $1.3 billion in additional federal funds in 2006 and 2007 because of budget shortfalls, seven received 79% of the funds and covered children at high income levels, adults, or in some cases, both. Congress can return SCHIP to its original focus on uninsured low-income children by setting a firm cap on eligibility that applies to both SCHIP and Medicaid and by restoring fiscal discipline. Blindly expanding SCHIP up the income scale would eclipse the potential of other more desirable ways of expanding health coverage for children in lower- and lower-middle-income families — especially refundable health care tax credits, an option that has already attracted a broad bipartisan and philosophical consensus. Friday, September 12, 2008, 3:00 p.m. – 5:00 p.m.
For more information, please contact Linda McDonald at 617-432-5522 or mcdonald@hsph.harvard.edu. Monday, September 15, 2008, 12:15 p.m. – 2:00 p.m.
Grace-Marie will moderate a panel on “A New Era of Delivery Models: Revolutionary Practice Models to Improve Prevention and Care” on Wednesday, September 17. Grace-Marie will speak about issues rural residents face in accessing health insurance. For more information, please contact Mary Thompson at mary@farmfoundation.org. Tuesday, September 16, 2008, 8:30 a.m. – 4:00 p.m.
Grace-Marie will speak about “Health Care Reform Redux: Can the Policy Divide Be Resolved?” on Thursday, September 18. How Should Virginia’s Healthcare System Be Reformed? Thursday, September 18, 2008, 3:00 p.m. – 5:00 p.m.
Friday, September 19, 2008, 12:30 p.m. – 2:30 p.m.
Monday, September 22, 2008, 8:00 a.m. – 12:30 p.m.
For more information, please contact Mario Coluccio at 212-417-9169 or mario.coluccio@cmpi.org. Monday, September 22, 2008, 10:00 a.m. – 11:15 a.m.
For more information, please contact Cheryl Lawrence at 202-626-4812 or cheryl.lawrence@bcbsa.com. Grace-Marie Turner will speak about “The Role of Consumer Driven Healthcare in Health Reform” on Tuesday, September 23. For more information, please contact Kisa Caldwell at Kisa.Caldwell@heritage.org.